In war time ordinary men and women are asked to do extraordinary things. This is the story of the part some Isle of Wight merchant sailors played in rescuing allied troops from the beaches of Dunkirk. 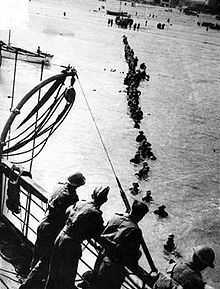 Many books and articles have been written about the way in which, in 1940, a doomed British army was rescued from almost inevitable defeat and surrender by the skill and dedication of the Royal Navy with the assistance of an armada of civilian boats, and the bravery of Royal Airforce pilots. The aim of this website is to move from a description of the grand theatre of war down to a local level and tell the tale of how some Isle of Wight men of humble backgrounds responded when called upon to face the danger of death and injury for the sake of their country. However, this story is not complete and I would like to encourage anyone with information to add or stories to tell about the Island’s heroic contribution to the operation to add their contributions. I have chosen to tell the story of the motor-barge The Bee and her crew. This is partly because her skipper was my great uncle, I was born in his house and during the war years while my own father was away in the Army I lived there, but also because we are lucky enough to have a complete narrative of the Bee’s voyage written by the ship’s engineer. There were five other similar Island boats which went to Dunkirk. These were the MFH, The Murius, The Chamois, The Hound and the Bat. It would be wonderful if relatives of their crews could contribute to this website. Fred Reynard was the ships engineer and he was also my late Grandfather,he passed away in 1987 aged 93. He told me all about his trips to Dunkirk and often took me onto the Bee when moored at Newport Quay when i was a child. My late mother Mrs D Sibbick was his only child. Thank you so much for getting in contact about your grandfather. I have tried for some time to trace Mr Reynard’s descendants. I am at present on a return voyage from visiting Dunkirk. When I get home I will write again with reference to your grandfather. I could not see your name on your e-mail, perhaps you could repeat this for me. I am the grandson of F.Botten (Frederick James Botten) who served as the fourth hand on the MV Bat, one of the Pickford Small Boats that took part in operation Dynamo. I notice on your website that you have my Grand Fathers surname as Bottom. Please correct it to “Botten”. Also, I assume it would have been the same for all the men who went on Operation Dynamo, although I can’t prove it. But my grandfather passed onto me via my father a Silver cased Fob Watch with a heavy silver chain (The name of which escapes me for the moment) which he was presented with by Pickfords. The watch has been assessed in the past by a reputable firm of jewellers and confirmed the hallmarks, etc, and the metal used. The front face also states the maker, etc, and gives what I believe to be the model name of the watch, as the “Kendentick”. I also have a letter of thanks from Pickfords somewhere that goes with the watch, but I have put it somewhere safe. So safe that I can’t find it. Although well used by my Grandfather for most of his life after receiving it, at the age of 32, it is still in good working order. When I was a student, back in 1960, I had a vac. job working with Vectis Shipping (Mark Croucher, M.D.) on the “Moultonian”, a former ketch-rigged auxiliary barge of 94 tons, built in Littlehampton in 1919. The skipper rejoiced in the name of Bill Broomhead and the mate’s name was Stan. My chum at the time, Tony Hooke, worked on the Murius, I seem to remember, and we had great fun passing each other en route for Southampton Town Quay and back, usually with a general cargo. We sometimes did the run to Portsmouth, loading beer from Brickwoods Brewery, now sadly closed. I often wonder what became of the “Moultonian” and what tales she had to tell. The whiskery bosun on Newport quay, who taught me to tie a bowline, for which I shall always be grateful, remembered winching blocks of French granite aboard by hand at Caen, presumably many years earlier. She doesn’t appear to have been a ‘Little Ship’ and must have been confined to home duties during the wartime period. She may well have ended up as a houseboat somewhere along the coast. I hope she did – I’d make a special trip to see her again. Any news would be welcomed. Incidentally, there were two other, more modern coasters operating with Vectis Shipping at that time – the “Sea Close” and the “River Close”, both painted grey and very smart and up-to-date as compared with the old, black “Murius” and “Moultonian”. I also remember the “MFH” and the “Tantivy”, BRS coasters which also ran up to Newport quay. Cowes, Newport and the Medina have changed quite a bit in 50 years! there is also a picture of the time piece given, after long conversations with my nan about her father she told me that chamois was the only small ship from the island that didnt have a member of the royal navy on board. which all the other boats were made to have. this was because he had been a serving captain in the royal navy. when the boat made it to dunkirk and picked up some men, they had taken on a french policeman who had had his leg blown off. the soldiers wanted to chuck him overboard but the captain refused. on the way back a ship next to him took a direct hit and was blown to bits, my greatgrandad fished the name plaque of the boat out of the water and this is sitting in my nans garden shed 70 years later along with the ladder they used to bring people onboard with. Minor correction re the Barge Hound. The Hound was not broken up until 1985. She lay on the east side of Wootton Creek and for a number of years acted as a quay to hold up Marigold – the now restored 89ft Nicholson gaff cutter. I salvaged the name board which Wayne is holding in the picture and also the two quarter knees when she was broken up by the developer of the creek bank land along Barge Lane for housing. The knees now support the old beam in my dining room. My grandfather George Plumbley worked at Shephards with Fred Reynard, grandad drove steam engines for them and was on the Bee though didn’t go to Dunkirk. Grandad used to be engineer on the Bee as my Uncle Charlie used to tell me cooking bacon and eggs for breakfast when he took my dad and uncle up the Medina on an upturned shovel held over the boiler! My mum Doris Plumbley’s mother was a Leigh who Wayne Pritchett is also related to, the Leigh’s as Wayne told me owned the Chamois and the Gazelle, not sure which one I have in a picture of my Mum aboard one of the boats but it is a beautiful picture of her when she was young. At a funeral yesterday on the diamond my cousin was telling me the Chamois has a plaque on the key about going to Dunkirk too. At the funeral yesterday my cousin Stephen had some beautiful pictures of Grandfer Leigh as he was known and one he is on either the Chamois or the Gazelle with perhaps Aunt Nora or my gran, it looks like it was taken on the river opposite the cemetary where he is buried. Must come over and walk the river as it is etched deep in me and as yet I’ve never sailed down it so must make amends thanks for some great reading here. William Charles Trowbridge was my Great-Uncle. His sister Elsie Marie Trowbridge married my Grandfather (on my fathers side). My Grandfather was Horace Alabone Dabell. When Bill Trowbridge died my father was executor and I and my brother Edward were beneficiaries under the will and inherited some personal effects. I have an identical presentation pocket watch as described abpove by Richard Botten. I have only just found out about this web-site. Am I correct in assuming this has been compiled by Michael Wills ? If so – please get in touch – would love to hear from you. In 2010 I put a gravestone on Uncle Bill’s unmarked grave, with the names of his crew. Hello, I’m a descendant of the Leigh family, I believe that they possibly owned the Bee prior to Operation Dynamo. I’m not sure though, would love to know more! I am writing an article on Southampton’s Railways and Docks for the magazine The Southern Way. I would like to include an mage of mv Norris Castle which appears on your IOW to Dunkirk website but to a higher resolution scan. Can you put me in touch with the copyright owner please? Hello Alan, I have been trying to find the source of that picture. I fancy that I may have scanned a picture from the private museum which the Newport Harbour Master has in his office on the quay. It is almost certainly a picture in the public domain, though I have no proof of this.